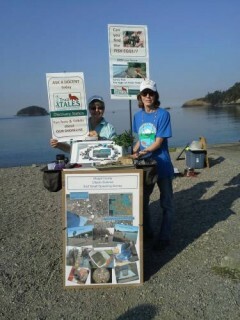 If you are a Friends of Skagit Beaches member or volunteer, you’ve probably heard of the Trail Tales project. Just in case you haven’t, I suggest you take a walk along the Tommy Thompson trail along the waterfront in Anacortes and you will quickly come across the interpretive signs that bring the history of the waterfront to life. I have been fascinated by how this project came to fruition. How did the idea behind the Trail Tale signs become a tangible and valued tourist attraction? Betty Carteret was happy to sit down with me and share how this project came about. Trail Tales is the story of how one person envisioned an idea and created a tangible legacy for her community. I want to share this story because too often we just don’t know what to do with great ideas. How did Betty, the woman with the vision of what Trail Tales could be, go from dreamer to doer? Point 1: Coming from different parts of the world, we can bring fresh ideas to a new community. Betty came to Anacortes in 2005. She grew up near Williamsburg, VA, a world-renowned hub of historical interpretation for the American Revolution. She says that living in a community that celebrated its history and made it the center of their local economy taught her how engaging and educational interpretive programs could be. Williamsburg, one of many east coast colonial historic sites, preserves the history of the town while educating visitors from around the world about life lived over 200 years ago. Whatever your own ancestry is, it is impossible to wander through Williamsburg and the surrounding historic sites without having a deeper connection to the past. In Anacortes, Betty could see beyond the marinas, boatyards, and businesses to the history of the community. She saw a story worth sharing with local residents and visitors to the area, a way to combine enjoyment of the shoreline with a learning experience. Point 2: You never know where an idea may lead you. Another piece of Betty’s experiences also fed into the idea behind Trail Tales. In researching interpretive programs, she came across the United Nations Voices project. This multimedia project used billboards, voices, print and cellular phones to engage the public in a campaign to better understand the plight of underrepresented communities. Betty saw how different mediums could be used to engage people with learning. This informed her decision to create both a physical interpretive experience on the shoreline with a website for those who prefer and online experience. Point 3: Ideas are like seeds – they need roots before they sprout. 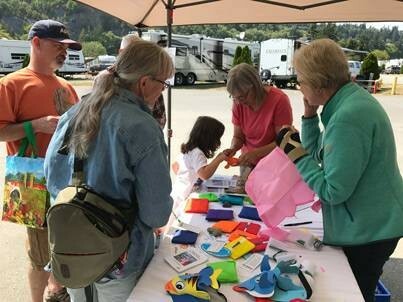 Friends of Skagit Beaches arose out of a need for members of the Skagit County Beach Watchers program to raise funds to support their volunteer work. Betty was part of that founding process and served as the first president of the board for this small non-profit. Friends had limited funds but a mission that drew many like-minded individuals to the table. As Friends grew and expanded its presence in Skagit County, they looked for impactful projects to support. For Betty, the shorelines of Skagit County were, in her words, not seen – at least not with the historical perspective she brought from her old hometown. She saw the legacy of the past for both the First Nation tribes and colonizing settlers fading even as the Department of Ecology (Ecology) completed a major waterfront clean-up that redefined the waterfront of Anacortes. These seemingly unrelated ideas didn’t come together until Betty attended an informational meeting for the Washington Department of Ecology Public Participation Grant program in 2010. What would it take, she wondered, to create a series of interpretive signs that engaged the public in the stories of the waterfront? Betty explored the idea with Ecology and they loved the idea. 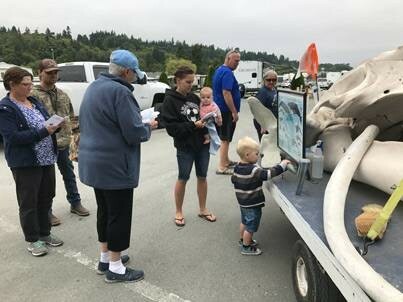 It was innovative and was seen by Ecology as a positive way to engage the public in understanding and participating in the decision process of their important shoreline cleanup program called the Anacortes Baywide Cleanup. Ecology had never received a grant application that proposed to use interpretive methods, including signs, walks, website, and films, as a way to promote public participation. Point 4: Collaboration can make the original idea stronger. Betty continued to develop this idea within the parameters of the grant with Ecology. She knew that it was going to be important to Ecology for the public to not only see the history of the waterfront but also understand why the clean-up had been necessary. The story of the clean-up, a cautionary tale of how historic industries had no idea that their working practices were harming the natural environment, showed how we can clean up the toxic by-products, restore natural processes and habitats along the shoreline, and rejuvenate the marine environment. The City of Anacortes Parks & Recreation Department and Museum, the Samish Indian Nation, and Port of Anacortes all came forward as partners to help make the Trail Tales interpretive sign project a reality. Point 5: Seeds of ideas can grow into amazing experiences. Former Friends’ Board member and Anacortes City Council member, Erica Pickett, said “Betty thinks big. The rest of us would have asked for a couple of thousand dollars and put up one sign but she went for an entire interpretive trail with dozens of signs, interpretive walks, and a website.” The Trail Tales grant has spurred Friends to a whole new level of engagement and activity in our community and left a legacy along the shoreline that will benefit the community for decades to come. The City of Anacortes just granted the Trail Tales project a lodging tax fund grant to reprint the map brochure and repair damaged signs, acknowledging the positive impact the project has had on tourism. The Trail Tales brochure is often the first one reached for at the visitor center and allows visitors to explore Anacortes and engage in a historical journey that is still being played out in the city today. There are links embedded in the sign brochure that take the viewer to a website filled with videos and information that bring the waterfront to life. I’ve walked the Tommy Thompson trail many times and I’ve enjoyed reading about Fidalgo Bay – looking at what there is today while also studying the pictures from a not so distant past. Betty is right when she says that when an Anacortes resident understands the history of this waterfront it will make that person’s experience living here richer. As someone who has only been here for the past few years, I think the experience reaches farther afield. Whether you have come from another place in this world or lived here your whole life; whether your ancestors were the settlers or indigenous tribes – the interpretive signs depict a universal cycle of development that some will celebrate and others will mourn. Either way, it is important to grapple with that. 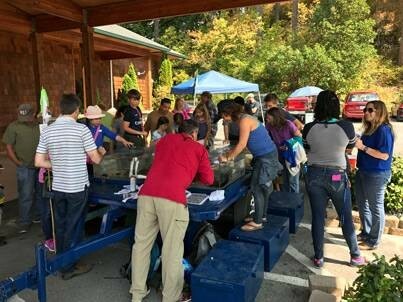 This is the power of interpretive education – all those experiences get to co-exist along with the ways in which certain agencies and non-profits, individuals and groups, have been working to restore the fundamental health of the nearshore environment. Visit the Trail Tales website or next time you're in town, stop in at the Visitors’ Center and pick up a Trail Tales map to begin your exploration of the Anacortes shoreline. What ideas have you been carrying around with you and what's one small thing you can do to help them find fertile soil? Drop us a line, maybe we can help! Friends of Skagit Beaches received the good news on November 28, 2017 that their application to the city of Anacortes’ Lodging Tax Fund was selected by the city council to receive a $3000.00 grant. Board member, Betty Carteret, the project lead for the Friend’s Trail Tale project, submitted the grant application requesting funds to reprint map brochures and replace damaged interpretive signs on the Tommy Thompson Trail. The brochure and map, which are available for free at a number of locations around Anacortes, show the location of interpretive signs installed as part of the Trail Tales project. At the time the brochure was designed, it was decided to include other landmarks and tourist attractions around town to make it useful for tourism. That decision has made this brochure/map the first on the that volunteers at the Anacortes Visitor Information Center reach for when directing tourists to activities and locations around town. In addition to that, the Port of Anacortes has distributed the brochures in the Welcome bags they give to boaters staying at Cap Sante Marina. Between 2011 and 2015, Friends installed 33 interpretive signs between March Point and Guemes Channel. The signs were funded by a grant from the Washington State Department of Ecology to highlight the history of the working waterfront and the Anacortes Baywide Cleanup program that has restored contaminated locations along the Fidalgo Bay shoreline such as Seafarers Park. Some of the signs have been damaged by vandalism or air bombardment by seagulls dropping tasty bivalve shells onto them from the heights to break them open. This damage had led to the premature deterioration of the high-pressure laminate making a couple of the signs in need of replacement. The signs were developed and installed in partnership with the City of Anacortes’ Parks and Recreation Department but are still considered the property of Friends of Skagit Beaches. The city’s Lodging Tax Fund receives portion of tax monies collected from guests staying in local hotels and is awarded to applicants who apply and meet the eligibility requirements. 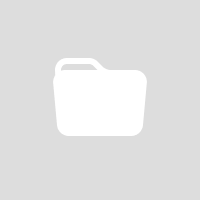 The guidelines specify that money must be spent on things that directly relate to attracting tourism or are required to maintain or operate a tourism-related facility by a non-profit. The Friends’ application fit that bill and the city awarded the $3000.00 to print 20,000 more map brochures and replace two signs. Since the Ecology grant for Trail Tales ended in 2015, Friends has not had the funds to cover this type of expense. Friends of Skagit Beaches greatly appreciates this grant from the city! It should also be noted that the city council committee that reviews applications also recommended that the Chamber of Commerce work with Betty Carteret and her sign development partner, Jan Hersey, to expand promotions of the interpretive trail as a tourism growth opportunity. Discovery Passports are a Hit! 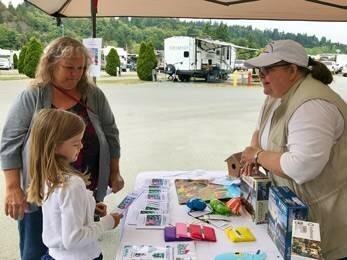 Friends of Skagit Beaches again sponsored the Discovery Passport activity at the 2017 Fidalgo Bay Day event on August 12th. This year was bigger and better than ever. We distributed 203 passports, which was double the total from last year. Kids (of all ages) had a great time grabbing their passport and heading out to visit the Passport Stations where they were challenged to answer a question about that station. This year we had 14 stations to visit and in order to collect a prize participants needed to visit at least 8. It was so much fun that most of the “Passporters” visited them all. It’s sooo hard to decide which prize to pick. Our theme this year at the Information Table (Station 1) was reducing marine plastic debris going into our waterways and oceans. With that in mind, some of the prizes were reusable plastic shopping bags and produce bags (like the one in the above photo on Dad’s arm). Participating organizations all agreed that being one of passport stations brought more enthusiasm to their interactions with visitors to their displays. Early arrivals admiring the passport cover art! Station 4 – Shannon Point Marine Center’s Touch Tank was probably the busiest station with lots of critters to see and feel. Station 5: Deception Pass Foundation’s Gracie the Whale skeleton is really big and really cool! 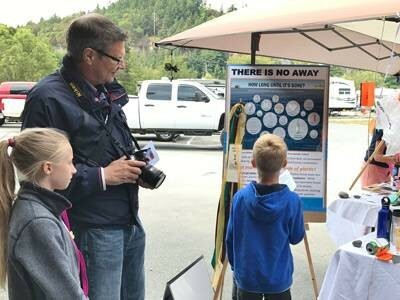 This is what Michelle and Barbara have been saying over 1000 times to captivate the interest of the general public since the inception of the forage fish interpretive station only two years ago. 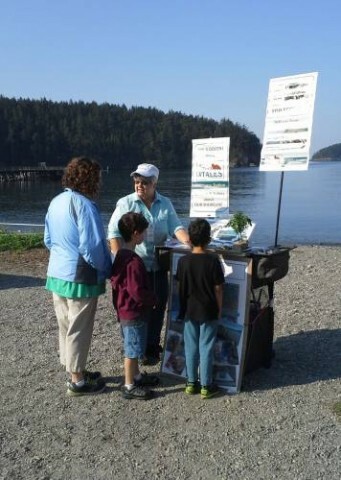 During that time the forage fish interpretive station has followed the citizen scientist forage fish egg surveyors onto the beaches of Fidalgo Island, participated in educational events such as Fidalgo Bay Day and the Salmon Festival, and presented an interactive program to junior ecologists at Padilla Bay and elementary classrooms. Our mission is to educate our visitors about – (1) what are forage fish, (2) why are forage fish so important to warrant this much effort, (3) what constitutes a healthy beach for Surf Smelt egg spawning? If you are interested in learning the answers to these and many more questions please look for us on the beach!